This summer at ISTE I repeatedly heard Jerry Blumengarten (or better known as Cybraryman on Twitter) say, "Challenge yourself to try something new!" With this in the forefront of my mind at the beginning of this school year, I wondered what I could challenge myself with this year. One area that came to mind was coding and robotics. For some reason, I felt uncomfortable with these topics when they came up, and I usually pushed them aside for more exciting technology adventures that captured my attention. Later on as my district got started planning for this year's Hour of Code I felt a tinge of guilt because of my lack of interest and hesitancy to personal engage these learning tools. What was holding me back? I finally admitted to myself that the few experiences I had in these areas left me frustrated and confused. What could I do to change my perspective? I decided to set aside my past experiences and try a new learning approach. I would find students who I could learn with and from as we explored these topics together. I would let the enthusiasm of the students help spark my interest! I purchased the various robots listed below, asked for classrooms wanting to explore with me and many excellent adventures began! As I researched, I found a wide variety of robots which led me to consider, "What is a robot?" Here's what I found. Simply put "...robots are a machine that can sense, think and act." As I looked at various robots, this helped me consider the different abilities each robot had for sensing, thinking and acting. Once I had my tools, I then needed an exploration group to learn with. Because I was working with middle and high school Enrichment Classes at our alternative school, these were the perfect students to get started with. I used the Finch robot with these students because they could be operated by a Chromebook, the device my district chose for our 1:1 rollout in middle and high school. I quickly explored getting started with the Finch on YouTube and Google (see resources below), but my goal was to explore and learn with the students, so I didn't feel the pressure of "needing to know everything." Quickly, I picked up different strategies and ideas for how to operate the Finch and my confidence was growing. After sharing my experiences on my District Google Classroom Technology Cohort page, I received requests to include younger student, It was time to expanded my learning audience. Each session I started off telling the students, I would not be telling them how to work the robots, but instead, they would be exploring and figuring it out with their team as well as learning from the other teams through questions. Wow, the learning seemed to go into hyperdrive! I broke my sessions up into short segments of student exploration and group sharing/questioning. It was amazing to facilitate this type of learning and seeing every student actively engaged in the learning process! Even more wonderful about the process was being able to participate in the conversations and sharing of the different learning experiences. Wow, I was hooked! Ollie, Sphero, and Dash can both be operated by IOS devices, the dominant technology tool in my district's elementary schools. I had seen many of my PLN members begin sharing their experiences with these tools, so I felt they would add another dimension of learning not only for me, but also elementary students. Ollie and Sphero are a bit different than the Finch in a couple ways. First it is bluetooth operated which allows freedom of movement as opposed to being connect by through a chord like the Finch uses. Second, these two IOS robots can be operated with or without coding. We used the Tickle app for coding the them. Finally, the these two wireless devices demonstrated a greater level of accuracy than the Finch. Not only were my positive experiences with coding and robotics growing, but I was developing a wider range of experiences with different devices. One of the students I worked with, Kenneth M. was so excited about working with Ollie, he created a prezi about it. Now it was time to explore a robot not controlled by a device or coding. I found Cubelets, a modular robot (click here to learn more about this type of robot) and this devices definitely took me to another level of exploring. The different cards included in the kit were very helpful in understanding what each cube was capable of, and the challenge of exploring with Cubelets is to explore the wide range of possibilities of different cube combinations offered. It was quite simple, learn the capabilities of each cube, pick them up and start trying different combinations. That's exactly what the students and I did! The Ozobots, an exciting addition to our line-up of robotics exploration finally arrived! These robots have a special capability that the students enjoy learning as they write their own code with markers and paper to control these robots. Oh the endless possibilities students have with these amazing tools! What each of the different types of robots offered myself and the students that I worked with was the opportunity to explore design, engineering, and various behaviors of different types of systems. The level of communication and collaboration between students was phenomenal. What an exciting way to engage students in the learning process and prepare them for their futures. These experiences are real world learning at it's best, and the students absolutely LOVED it! Have you explored robotics? If so, what have been your experiences with them? What type of robots would you recommend me to explore next? Let me know your feedback in the comments below and thank you for allowing me to share my learning experiences with you! 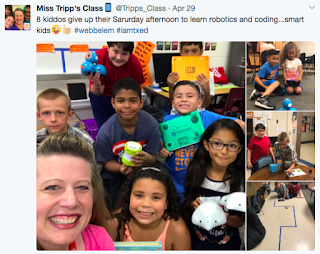 Since starting my journey into the amazing world of robotics and coding, I have been able to impact over 1,300 students and 250+ teachers with my personal story of diving into the world of robotics and coding. I have found audience after audience of students dying to get their hands on the robots and explore the amazing possibilities of these critical thinking tools. I've seen students push themselves to think, strategize, and go above and beyond the normal efforts they would have applied to other thinking topics. I have even had students come to school on Saturdays wanting to spend their day off in exploration of robotics! What has surprised me the most in this two year journey, has been my fellow teachers who have flocked to my sessions on robotics and coding admitting the same apprehension and fears that I held in the beginning of embracing robotics, coding, and the power of play! I just finished my fourth conference sharing about my robotics and coding journey at my second appearance with the South Carolina Association of School Librarians Conference. There are many people wanting to embrace these new learning approaches, but I have found their 'fear of the unknown" has stopped many of them from starting their journey. It has been very fulfilling to see these sessions participants' fear melt away and be replaced with excitement to begin their own journey into the world of robotics and coding...SUCCESS! 1. The Finch, its capabilities, and coding it with Snap! If you are working on a Chromebook, download the Finch extension in the Chrome Store. 5. Ozobots, drawing paths for the robots, and ozobots in action! Google Sheet of data collect by students exploring the various robots. Click here for the Ozobot code Avery label stickers! The Ollie and the Ozobots are the same because they must be coded in order to work. Also, they both sense the environment around them. The Ollie has a face to it, that lights up in colors. The Ozobots uses the colors in order to determine how to behave. For me, I liked the way I could draw out the colors and designs to make the Ozobot work the way I wanted it too. The Ollie was more computer controlled instead, which for me was not as much fun as the drawing. Kamari l at NMS. this time had the finch last time and this time i had sphero and they are different because you controll them 2 very different ways and they are alike because they are both very hard to controll espiaclly the finch and i liked working with these robots becuase you never know if where you work in the future is going to have robots and becuase they interact with you and you can controll them. I had the Finch first and then the Sphero. One way the Finch and Sphero are alike is by how they move. They move with coding. Another way they are alike is how they can change color and light up. The Finch is different from the Sphero because the Finch has to be plugged up to the computer and the Sphero does not. Another way the Finch and Sphero are different is how the Sphero can dance, play music, jump but the Finch can only move back and forth. I liked how the Sphero jumped and how the Sphero was easier to control. I also liked how the Finch changed colors and you could change the colors. Etana B. NMS. The two robots I've worked with are the Finch and Shpero. The Finch and Shpero can both be controlled by the coding app. But the Finch can only be controlled by the coding app. And the Shpero can be controlled by the coding an app on a device by moving the controls with your finger. I liked the Shpero because you can tell it to jump and spin and other things. And the Finch could light up while you were moving it and that is what I liked about that. I used Sphero the first time and then Cubelets the second time. Both of the robots could move and light up. The Sphero could spin and go fast. The Cubelets could connect together, and there were multiple cubes. Two ways I liked them was they can interact with you and move. Also, they can connect with your devices, like an iPad and Chromebook. I really enjoyed learning about coding through using both of the robots. Micah T. Northside Middle School. They both had sensors, and both had motion. They were different because one had codes and the other didn't, and one had cubes to put together and other didn't. They were both fun and enjoyable. I used the finch robot. We were able to move it by using snap which is a way that you can make the finch move, sense, and think. I enjoyed the robot and how you could get it to move while you are using your Chromebook and how you can make it flash a certain color of light. I used Ozobot for the first time. I really liked it. And I liked when it read the Color Code because it knew what to do. it is a small robot and you need to know how to work it. I used the Finch robot, I had gotten to level 2. It does these actions by connecting it to you Chromebook and downloading a app on here. Then on the website you put what way you want it to go for example back,forwards,left,right,and rotate. I learned how you can do more than one step in a slide. I worked with Finch and Ollie. Two ways these two robots are alike by, they both need to be programmed and they both move. Two ways they are different is by, they look different and how they sense, think, and how they act because they are different robots. I really did like the Ollie on how it acted when we were programming it, and I liked how the Ollie was and how it moved. Today I worked with the Ozobots.They had sensors that followed color codes.I made it sense by writing a color code and it followed.I enjoyed drawing interesting color codes.I enjoyed how fun it was to learn about how robots work. The robot I used first was Ollie.The second time was the Cubelets.To work the Ollie you had to program it to make it move.To work the Cubelets you had to put them together to see how they work.The Ollie and the Cubelets are alike in that they both move and have light.The difference between Ollie and Cubelets is their different shapes. I had the Finch last time and this time I had the Ollie.They both were fun,the Ollie was crazy,moving around everywhere really fast. The 2 robots I used is the Finch and the Ozobots. The Ozobots was really cool, I liked how when it went through the colors it did different things. The 2 things that are alike the Finch and the Ozobots is the different colors both of the robots change different colors. The interest things I Learned about the Robots I used are The way the change different colors and the way how fast they are. I worked with the Ollie and the Cubelets. Both of the robots are the same Because they are both robots and they both are able to act/move.Ways they are different are they are both different sizes and shapes and both are controlled differently, (one by a tablet & the other by your hands). I really enjoyed working with the robots. I used the finches and the Cubelets.One had a senser and on didn't.One had a full body and the other didn't.I enjoyed the Finch because when you program it,it saves you information.I liked the Cubelets because you can make different types of shapes with it. We used the ozobots to make it move and dance around the track. The way to make a robot think, and act when you draw lines so that it will follow you. I learned that about our robot that it can turn colors, move, and scene things. I used a ozobot for the first time it was fun.I taught him to act by drawing lines on a sheet of white paper.I taught him to sense by writing colors in a specific order.I loved working with the ozobot!!! I mad the Ollie spin and go straight and do all kinds of thing like jump and go back and fourth. The Ollie was an enjoyment for me and my partner. I used a ozobots and I got it to think by the colors and patterns I got it to act when collaborating it. We used the cubelets robot.The way we got it to think was we connected the battery and turned it on and connected a sense block then we connected a light or a movement block or both then we let it move or light up or both. My robots where pretty hard at first then when my partner notice the reaction from the robots when me and him had kept trying and trying until we had noticed the difference between each block we had had. I had the spear bot and it was hard to control at first but I got the hang of it. It was really fun to work with. I used the iPad to control the bot and I had a lot of fun. I had the ozo bot I learned that depending on what kind of lines and what way you draw the lines that is the way it will go. Sometimes it would do some tricks like spinning,and u turns. I worked with the Cubelets I tought it how to sense when I put the scenser at the back and if it sensed motion it would run away that is why it is called a fraidy bot. I controlled the Ollie with the iPad and made it to where the robot could actually stop moving and go a different way.We made the robot dance and go down the hall and into the classroom.Also I made the robot seance and act by coding. I controlled a cubelets is cool because it sense is use by hand motion and think is when you put your hand in front it move and it act by going all around. I worked the Finch. I made it work with a program. It was very cool.It work very good. Very confusing at first but cool. i worked with sphero. it is a good way to find out new technology explore and interact with other people. I controlled a ozobots. I drew some lines for it can follow it. What ever colors u put it has something to do. I controlled the cubelets the way I made it sense by putting my hand over it, I made it act by making it move all over the place, and I made it think by me letting it follow me instead of going back and retrying. The one I think was fun that I made a awesome one. I worked with the Ozobot. I need to practice drawing the codes better. Electronics need to always be charged before used. I liked drawing the codes. I controlled a Ozobots. You got to draw the lines best as you can because if you don't it will mess up. I controlled the ozobots. I drew black lines for it to move on. Certain colors did stuff to the ozobot. What I liked about this was nothing because these are robots are not as fun as the others. I worked with the Ozobots,I drew some codes and they reacted to the codes and did what I said.They sensed my codes by reacting to them and they followed everything I said.I made the Ozobot think By having to make it read the codes and think about what to do in the track. That's what happened with my Ozobots today. I worked with the OzoBot. I made it think, act, and sense by putting certain code colors on the piece of paper, so that the OzoBot would follow and do what I wanted it to. It was very fun, and interesting, to do, and I hope that we can do something like this again!!!! I worked with the ozobot was kinda difficult and I learned that it needs to be charged for it to work correctly. I also learned that you need to draw the line good enough for it to work. I controlled a finch.We hooked it up to our chromebook and clicked on motion codes and made it move.It acts by clicking the codes.It sences motion and thinks before it acts. I worked with the cube-lets. It was hard to find out what to do with it then, I got the hang of it. It had a blue box it was the battery like on and off. It had a green box it was a passive box then I had a brightness box and the sensor box and the light box then the drive box. I made a fraidy figure where the robot would run away from my hand if i put my hand in front of it To me this was really fun to play with. I worked with the Ollie. The Ollie is a smart robot. Me and my friend Dai'Ariel made the robot turn plenty of times. The robot also made us laugh, because it hit a boy named Ethan. Even though we said sorry he even laughed at himself. We made the robot turn left and right and forward. The Ollie was very fun to work with. The teachers even took very off guard pictures when we were coding with it. Overall the Ollie was amazing, funny, and smart. With Dai'Ariel it probably wouldn't be as fun or able to work with. I worked with the OzoBots,make it work you have to read certain codes to make the OzoBot move and do other techniques and you look at the codes draw them on a sheet of plain paper and put you OzoBot on it and it will scan the code and do whatever the code says to do it was weird at first but it was cool. I controlled the Ozobot. When you draw a certain code on paper you make the Ozobot think, when you write down the code and put it on the paper you are making it act,I made it sense when I gave it the codes to follow. I worked with Ollie, me and my partner controlled Ollie on an Ipad. It took us a long time to figure out how to control Ollie and it was pretty difficult at first but we got the hang of it. We thought we had to use a little control button but we really had to press the play button. It was just like code we had to do all of the "code" work. But I really enjoyed doing this with my partner because I honestly think I couldn't have done this without her. I worked the Finch. I made it work with a program. It was very cool.It work very well. Very confusing at first but cool. I worked with the Finch robot. I made it sense by a program called Finch Connection App. I tried to make it think but it wouldn't work. It acted by the blocks that I connected on the app. I enjoyed watching the Finch robot move because we made a joke that it was attracted to them! It was a fun time working with Ms. Tripp. I worked on the Cubelets.I have never used or worked with them before, so it took my partner and I.The one that the Cubletes had to be afraid of was hard because we thought we were doing it right but we weren't. We got some help from Ms.Trip, then we understood what to do.All that time we had to only switch the sense and neutral. Our class has totally fallen for robots. We are getting ready to write a DonorsChoose grant to own some robots of our own. We will be integrating writing, science, math and social issues problem solving in our grant for robots. It has become our Project Based Writing. Thank you for this blog as it really will help us with the information we need for our grant. Thank you Ms. Tripp from SPR GATAS 4. The robots were basically fun but the finch wasn't that fun. I think that the ollies were the funniest robots, because it has speed and can do tricks. IT helps a lot with education wise, and engineering wise. We have had lots of fun with these robots. The robot we had was Finch and what we did was download this app and we coded him to do all these types of moves. We had to work together also to do this because one person had to code it while the other held the cord connected to up. This lesson with Mrs. Tripp was very interested and fun. Today was fun because I have never did something with those robots but it did make me mad because sometimes the code would not work with me but Ms. Tripp came over and helped me and then I had a lot of fun!!!! I worked with the Ozobots. I learned that the smallest error will throw you off track. I marked it through the black and Ms.Tripp walked over and realized it wasn't functioning and we found out that I did color coordinate right. I have fallen in love with robots they are the new language for the next generation. I am looking forward to work with this again. Thanks! Today our group in class were working with the Ozobots. These robots will drive on lines that you draw with markers on the paper. There are different colors that represent each code. I learned that these robots are pretty easy to write codes for and are fun to watch. 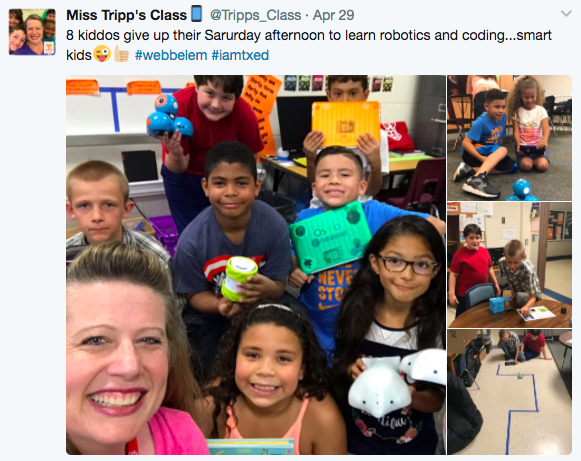 Today in class we worked with Miss Tripp with Ozobots, when we were working with the Ozobots it was challenging but then when we all worked together with the group we connected our codes and it was like a maze. I worked on the cubelets. At first I thought you just turned on the battery to the flashlight or wheels and it would just go, but then I figured out the distance and brightness block. I still didn't understand the passive block, but I understood that the brightness worked with the light, it was bright if nothing blocked it. The distance worked with both the wheels and the light. Today we worked with Ozobots. In order to make it move we had to draw certain codes. The codes are what made the robot move, sense, and think.